So I am sure some of you are asking “What the heck is a BLTAE?” right? Well let me tell you. 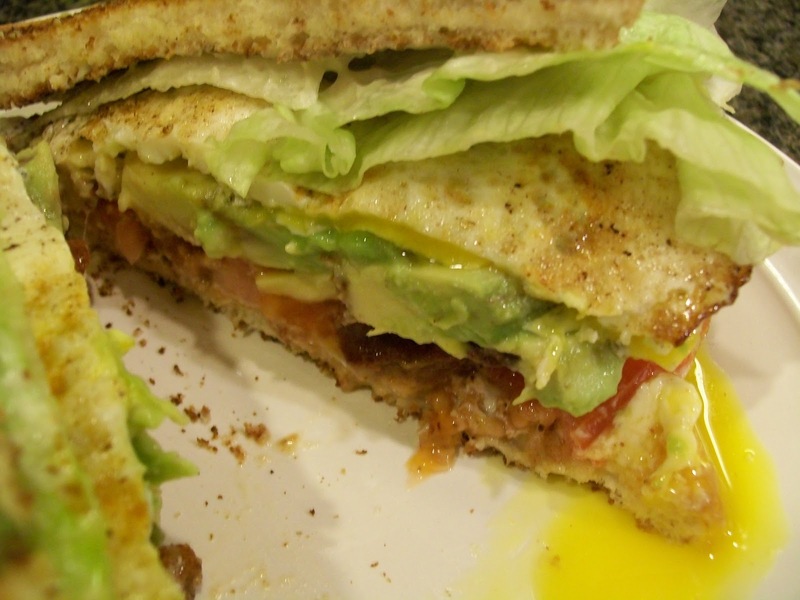 BLTAE stands for bacon, lettuce, tomato, avocado, with a fried egg on top of all of that loveliness! It is one of the best sandwiches I have ever had/made. Seriously, I am not joking. The first time I had this sandwich was at a local restaurant Kevin and I love. We always go there for dinner but they have recently opened for lunch so we took my son to lunch so we could show him the place. This restaurant is a wonderful “date night” place because the service is wonderful and the food is awesome with great prices! It is called The Green House and if you are ever in the Tacoma/Gig Harbor WA area you HAVE to give it a try. But I digress. Back to the sandwich. I have been craving this sandwich since that very first day I tried it. But for whatever reason (Lord knows it is the difficulty factor) I have never made them at home. Yesterday Kevin and I were the only ones home for dinner AND I just happened to have been to the store and purchased what I needed for the sandwiches, TADA I knew what we were having for dinner. When I put out on Facebook and Twitter what I was planning on making, one of my Twitter friends suggested I make a bacon mayo to go with it. I had been planning on a garlic mayo but ummmmm helloooooo bacon mayo? Heck ya!!! SO I was on a mission. The hardest part of this recipe is waiting for the bacon drippings to cool down so you don’t scramble the eggs for the mayo. Seriously, I was pacing the kitchen. It is kind of like a watched pot never boils. Watched bacon grease never cools!! Finally it was cooled and I knew when I added the vegetable oil to it to make the 1 cup total oil needed, it would cool it the rest of the way. I am doubling the sandwich portion of the sandwich so it can be a meal for 4. This is what Rachael Ray would refer to as a BLD, breakfast, lunch or dinner meal. You have your protein, veggies, and carbs on in one package. So, without further adieu, I give you the BLTAE!!! 8 slices of bacon, crisped and cut in half. Lettuce, whatever type you choose. To make the mayo use either a whisk or an immersion blender to blend the egg yolks with the dry ingredients. Add half of the vinegar and whisking briskly. Begin adding a few drops of the oil until the mixture begins to thicken and lighten. Increase the oil flow to constant and continue whisking. Once half of the oil is added dump in the rest of your vinegar. Continue whisking in the remained of the oil. Leave at room temperature for 1 to 2 hours. Can be refrigerated up to 1 week. Once the mayo has set for a bit. Toast your bread. Spread the bacon mayo on both sides of the bread and layer your tomato, and avocado on one side, topping with the bacon. Fry an egg just so the whites are cooked but the yolk is still runny. Place the egg on top of the bacon and then top with the lettuce and other slice of bread. WALA you have made your first BLTAE!! Enjoy!